There was no dinner at the country house last night; we’d gone over the river and through the woods to have lunch with her beloved Nana, and to deliver furniture to a refinishing shop. We stopped for gas on the way home at a dairy store where she worked during college breaks. Dinner, such as it was, was a double-scoop cone for each of us. Brunch today, however, was another matter. 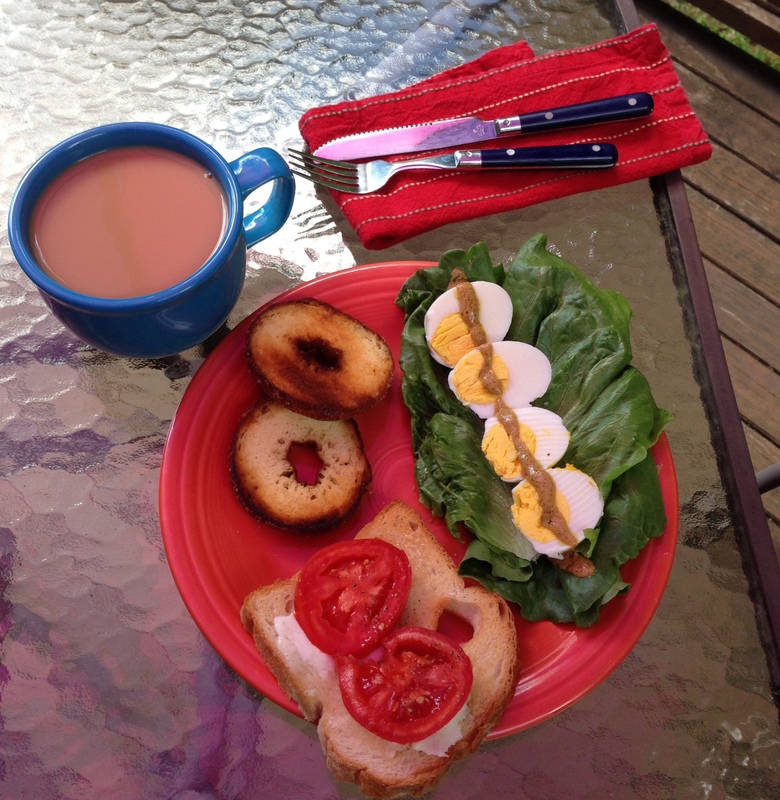 Open-faced tomato and mozzarella sandwiches on really good bread, sliced hard-cooked eggs over lettuce with a mustard vinaigrette, and an apple-cider donut, sliced and grilled. She had a wide-brimmed mug of sweet, light tea; I had coffee. I discovered that a beach umbrella fit perfectly into the table on the deck and provided just enough shade. It might not seemed authentic to a Parisian, but brunch on this late August Saturday felt very much like I remember simple meals at homes in the south of France on a trip long ago. That’s compliment enough for any cook. Some days you barely grab a bagel on the way out the door. When there’s time for a proper breakfast, you take it.